"The world is changing very fast. Big will not beat small anymore. It will be the fast beating the slow"
Nowadays, where lots of organizations operate in the globalized world and open market, the focus on competitiveness, flexibility, and dexterity has expanded and this requires more adaptive structures. Complexity and Change encapsulate the core challenges of the organizations today. Emphasizing on this, the department of management organized its 2nd international conference on " Management of Change and Complexity" to analyse and build unique change management strategies in different industries ranging from retail. Department of management of our college has made it a quest to organize this conference to bring together academicians, researchers and Industrialists from all over India to interact, collaborate and understand the change management principles and challenges. The deliberations witnessed the participation of 60 dignitaries from 5 states of India, representing 15 universities and 22 colleges. Papers written by 66 researchers were received from various parts of the country. The conference was inaugurated on December 6th 2018. Dr. Aloysius Edward, Dean, of Commerce and Management, in his welcome address enlightened the gathering about some change management strategies of different companies like Twitter, Google, Southwest Airlines and Facebook. Rev. Fr. Josekutty P.D. The Principal of our college in his presidential address emphasized on the concept of uniqueness and fostering uniqueness. From his experience, he mentioned Awareness, Desire, Empowerment and Reinforcement are the four elements that are required to manage change and complexity in an organisation. The chief guest for the inaugural function was Ms. Lilla Gourley, Director of Audit services, Grant Thornton. In her inaugural address, the chief guest highlighted on collaboration of ideas and shared leadership for better problem solving and change management skills. Keynote Speakers of the session I were Mr. Sunil Rawat, Director, operations, TE connectivity and Mr. Saleem S Khan, Senior Executive, Project Transfer, TE connectivity. They introduced TE connectivity and its Bangalore plant to the gathering. They displayed a presentation on "Enhancing Excellence in manufacturing" which elucidated various change management strategies adopted by TE connectivity in their volume drop period. TE connectivity considers competitiveness and responsiveness as core to enhance operations. They devised strategies like value stream mapping, Maynard operations Sequence Technique, low cost automation to cope with the dynamic environment. The session concluded on a positive note as the Interrogation session brought light on many challenges faced by B2B manufacturers and served to be highly informative. In the second session, the speaker was Mr. Sundar Vadivel Uthaman, Senior VP, HR, Landmark group. He enlightened the gathering on the topic "Enhancing Excellence through change management in Retail". He stated that retail is predicted to have massive change in the next 5 years than last 50 years. This is due to the fact that today's stores are shaped by new needs, behaviours and demands. He also mentioned about the levels of change management that is Constantly adapt, carefully listen and Always deliver, followed by the Landmark group. He also provided insights on LEAD strategy used by Landmark. He highly enlightened the students about the concept of retail. The session served to be resourceful for the delegates. Mr. Vinodh Nagarajan, Head of Tax, Dell EMC, the keynote speaker of the session III emphasized on "Key Tax Reforms and Business Impact". He began by mentioning the importance of tax policy for the country, the government and businesses. He elucidated the principle differences of direct and indirect taxes, alongside the GST reforms. He also introduced terminologies like Tax planning, Tax avoidance and Tax evasion to the gathering. The various Anti avoidance and dispute prevention measures were discussed. He concluded by stating the requirements of a ideal tax policy. The session was very interactive and proved to be really useful. The keynote speaker for the final session of this conference was, Mr. Muthu Kumaran, VP, Credit Suisse, who with vigor elucidated on the topic "Enhance excellence through change management in IT". He highlighted 3 key elements for Change management in IT, they are People, Technology and Process. He also presented on the evolution of IT methodologies like Waterfall methodology, Agile methodology, DEVOPS which are responsible for minimizing time and increased automation. The speaker brought the session to close by expounding on the fact how innovation and technology is a constant to sustain in the dynamic market. The valedictory took place on December 7th,2018. Mrs. Shilpa Rao, conference co- convener welcomed the gathering followed by the report of the entire conference given by Dr. Jisha VG, Conference Co- convener of the department. Mr. Georgy Mathew, FCA, Senior partner, Varma and Varma, the chief guest for the valedictory session addressed the gathering about the various challenges of managing change. He quoted a pool of examples which constituted the cases of change in organisational structure, Mergers & Acquisition, and change in product design. He concluded by saying "continuous skilling is the need of the hour". The valedictory session concluded with the Vote of Thanks proposed by Mr. Ajai Abraham Thomas, conference co- convener as he expressed his sincere gratitude to Mr. Georgy Mathew, the dignitaries, the participants and all the organizers for their tireless effort which marked the success of this conference. This conference enabled us to develop a clear and holistic understanding about the Management of Change and complexity and these resources will help us to create a High Performance Organization (HPO) in the changing competitive world. Rapid change in the business world have created threats for all the organizations and put them under pressure to regenerate their resource and strengthen their functioning on the bases of their core competencies. Paradigm shift is building a new talent management model to boost growth of the company. With this objective this conference was organized by Department of Management of the college to build unique practices in diverse fields highlighting the following sub themes:-Ethical Global Business Practices, Successful Implementation of Innovative Business Practices, Shift in Business Practices using Analytics and Shift in Business Practices through Risk Management	Department of management of our college has made it a quest to organize this conference to bring together academicians, researchers and Industrialists from all over India to interact, collaborate and understand the paradigm shift in the global business practices. The deliberations witnessed the participation of 64 dignitaries from 5 states of India, representing 15 universities and 22 colleges. Papers written by 57 researchers were received from various parts of the country. There were dignitaries from Nepal and Canada. The Inaugural function of the conference was held on March 06th 2018. Dr. Aloysius Edward, Dean, of Commerce and Management, in his welcome address emphasized on the recent technological changes and advances in the business and entry into the 5th generation of revolution in business. Rev. Fr. Josekutty P.D. The Principal of our college in his presidential address envisioned on quality acceptance and how people round the globe are initiating to bring a good trade among nations which sets the benchmark for a successful business economy. Mr. Rabin Katwal FCCA, ACCA Nepal Head , in his inaugural address enlightened the Participants on technology advancement in the field of accounting for the companies to favor ease in working and various accounting methods. Mr .William David Mccann Consultant, BCX Bespoke Customer Experiences, in his keynote address, elucidated on consumer behavior and their mentality. He predominantly expounded on the fact that no major physical changes were caused but just mental awareness brought radical change in what was expected. The thought provoking session swept the crowd off its feet which served as a major success of this conference. Keynote Speaker of the session I was CMA Mr. Milind Date, Chief Learning Officer, ISDC. He edified the delegates and on Ethical Business Practices in a Global Perspective view. Mr. Milind’s rich experience in the field of Strategic Management, ERP projects and being an esteemed member of IOD ,caught the attention of the listeners as he explicated on the values and behavioral aspect. He displayed a lucid presentation on the “Ethisphere Institute” which is an organization that defines and measures corporate ethical standards , which has short listed only 135 countries out of which WIPRO and TATA STEEL are the two proud Indian Origins. He further annotated the meaning of Ethical business behavior, it’s misconducts and causes. He also gave a detailed explanation on the best ethical practices in the corporate sphere , benefits of ethical behavior, the black lashing Myths and most saliently Tips for developing ethical behavior. Mr. Milind time and again highlighted on the importance of how the corporate world demands an optimistic attitude and how aspects such as integrity, loyalty, code of ethics, morality, whistle blowing and social values mold an employee or the organization as a whole towards being more ethical. The session concluded on a positive note as the Interrogation session brought light on many issues regarding ethics and served to be highly informative. In the second session, of Successful Implementation of Innovative Business Practices, the keynote speaker Mr. Guruprasad Dasappa, General Manager, Productions and Innovations, Accenture enlightened the delegates on Successful implementation of Innovative practices. Mr. Guruprasad entirely expounded on the significance of start- ups and unraveled the SIX PILLARS of Key innovation levers which are: Organization and Resources, Ideas and Initiatives, Collaborations, Learning, Performance and Governance and Strategy. He pondered over Enterprise Crowdsourcing and the importance of change and fragility. He predominantly focused on Design thinking and how it governs the corporate world, through which he concludes that Design is a process and has to be innovative. Being an esteemed member of the Indian Institute of Management he coined out points from his experiences , where he ultimately states that Mindset matters which would regulate Radical collaboration, synthesize Human Behavior, meaning Culture of Prototyping , aspect of being biased towards Action and the icing on the cake being “ Show , don’t tell”. Pinning out the key facts such as India being the second largest startup Eco-system , he perorated that to be successful one must be creative, should read, talk and pitch questions only will then startups having the ability to pivot can get into the world market .He highly motivated the students with the idea of startups. The session served to be resourceful for the delegates. Mr Sanjay Gopinath, Head, Marketing and communications, Mathworks, India, the keynote speaker of the session III emphasized on Shift in Business Practices using Analytics and also on structured data and the crucial demand for Data Science. The application of Data analytics in the field of Finance, Human Resource, Operations and Marketing was also highlighted. The need to make quick decisions, democratization of Information and various business challenges were discussed. The importance of Analysis and its dominance in the business world were the eye-catchers , as he mentioned that analytics is a part and parcel of the important decisions been made in business and also paves one’s path in becoming a Player of the Market. The session concluded with resourceful information on MATLAB and various techniques to improvise sales. The listeners also gained colossal information on the various learning tools provided, the employability rate in this field and the various aspects of approach. On the whole we hope the session served as a didactic one where the delegates and students were enlightened on how these analytics are being perceived in various fields and finally on how Analytics sculptures the business world. Plenary session was divided into three chaired by Dr.Guru Basava Aradhya, Dr. Baba Gnana Kumar and Dr.V. Muthu Kumar. 32 papers were presented by the participants on various topics. The keynote speaker for the final session of this conference was Ms. Rekha Jagadish, Asst. Manager, Risk and Compliance, Wells Fargo, who with vigor elucidated on the Shift in business practices through risk management. “A company’s major success is determined by the efficient management of risk and executes the decisions”, on this note Ms. Rekha enlightened the delegates on corporate governance in the business world and how it serves as a key factor in taking decisions. She also drew the differences between Traditional Risk Management methods v/s Recent Trends in Risk Management and gave factual paradigms such as COSO, Sarbanes oxley act, Lehman Brothers case etc. She shed light on the Enterprise Risk management concept and it’s cultural shift over the decades. She also mentioned the methods of proactive approach towards risk management and it’s 7 key concepts i.e., Industry Environment, Event Identification, Risk Assessment, Risk Responses, Information and Communication and finally Monitoring. These concepts are mold the approaches towards risk management and making efficient decisions. She stated that essentiality of Risk management in the banking sector as it is constantly prone to unforeseen risks. She concluded vivaciously by saying “Risk Management is Everybody’s Business”. This session proved to be encouraging as to see the importance that women are gaining in various remote sectors of the business world. The valedictory took place on the March 7th,2018. Mrs. Shilpa Rao, conference co- convener welcomed the gathering followed by the report of the entire conference given by Dr. A.J Excelce, Conference convener of the department. The Vice Principal Rev. 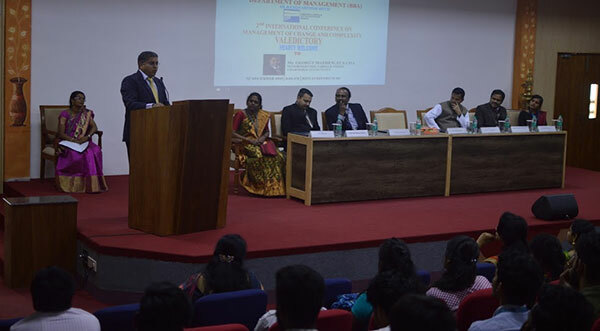 Fr Augustine George delivered the Presidential address in which he proudly stated that the ICPGP ‘2018 was the 462nd conference taking place in the college, it is also the 5th International Conference and the 22nd National Conference taking place for the Department of Management and also appreciated the efforts of the participants , the efforts they incurred for the presentations and also the organizers for the success of the event. He further shared a few tips on making a business productive by following 3 P’s which are People, Profit and Planet i.e. the work environment which served to be informative. Mr. Kuruvilla Choolackal, Head, operations, Quintype. Inc, the chief guest for the valedictory session addressed the delegates regarding start-ups, and entirely propounded on Digital Publishing and the scope of Digital Publishers in the near future through booming technological advances. He concluded by saying” The more versatile and adaptable you are, you will survive. Make new mistakes, which would help you, innovate”. This conference enabled us to develop a clear and holistic understanding about the paradigm shift in global business practices and these resources will help us to create a High Performance Organization (HPO) in the changing completive world. The conference was attended by both in-house and the external beneficiaries. 6 in house and 49 external attendees were part of this program. The delegates inaugurated the conference, and the resource person for the day, Mr. Mark D’Souza addressed the gathering about the ‘Innovation in Finance and Taxation’. Mr. D Souza, in his inaugural address, envisioned the innovation in Finance and Taxation. His main focus was toward the need for taxation, innovation agencies and about the real time exchange of taxation, Mr. D’Souza clearly elucidated the importance of GST, its objectives and benefits to the manufacturer, the wholesaler- retailer; and finally, the consumer. Electronic remittance, payment information and other context To be associated with a transaction was referenced and inextricably linked to a universal resource locator or (short form of web reference) Constructed so that it also identifies the payment originator, transacting merchant or service provider if the payments are outsourced. The session was really motivating. The second session about Innovation in Entrepreneurship and Startup was handled by Mr. Sanjeev Sukumaran. He emphasized on the need based research and solution to solve problem and implement tangible measures, innovation and entrepreneurship as a practice and a discipline. It does not talk of the psychology and the character traits of entrepreneurs; it talks of their actions and behavior. It uses cases, but primarily to exemplify a point, a rule, or a warning, rather than success stories. The work thus differs, in both intention and execution, from many books and articles on innovation and entrepreneurship that are being published today. It shares with them the belief in the importance of innovation and entrepreneurship. Innovation and entrepreneurship are discussed under three main headings: The Practice of Innovation; The Practice of Entrepreneurship; and Entrepreneurial Strategies. Each of these is an “aspect” of innovation and entrepreneurship rather than a stage .The session highlighted on innovative techniques in entrepreneurship and startups edging entrepreneur to be creative, conscious, compassionate and competent. The third session on Innovation in IT companies with special emphasis on TCS was conducted by Ms. Radhika Sokhi. Ms. Radhika Sokhi in her Keynote addressed primarily the various dimensions of innovation in IT Companies. The session encouraged the participants to provide consultancy services that would solve the problem of other institution/ organization and builds industry institution interface. The bench marks in innovation are the usage of current and efficient method to solve problems and participation in creative & innovative programs. This session was divided into three tracks and each track was chaired by Dr.Vijaya Baskar, Prof. Vijaya Kumar and Dr.V.Babu. 20 papers were presented by the participant on various topics. The session focused on the admirable innovations of Toyota. Mr. T.R Parasuraman suggested five bench marks of innovation in management – respect for principle, challenging spirit, Kaizen (continuous improvement), Genjigumbutsouei (trying to understand the problem with our own senses), and courage to challenge. Shri.T.R.Parasuraman in his Valedictory address, remarked how to master in our own fields with innovative techniques. The secret of success revealed by our keynote speakers were focus on continuous improvement efforts to develop passion and curiosity.